It's A Wonderful Life. Two-Disc Collector's Set. 1947. $17. Reviewed by The Wheelchair Watcher, Chike Coleman. 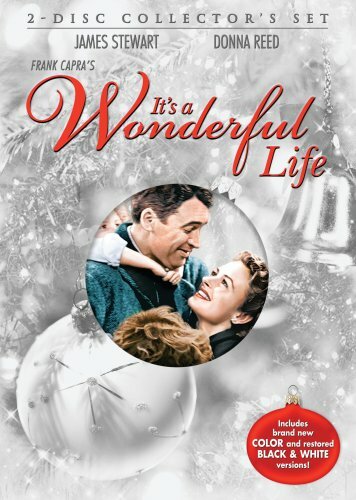 It’s A Wonderful Life is very special because the film illustrates the profound effect our good deeds have on others. Jimmy Stewart plays George Bailey, a man who gives everything to the world while getting little in return. George saved his brother, the Bank and Loan, a pharmacist, the working poor, yet he feels worthless and contemplates suicide. Francis Capra directed this feel good dramedy, which in many regards, is Dickens’ “A Christmas Carol” in reverse. Instead of seeing his bad deeds, Bailey sees a world gone wicked without his good deeds. This film works because Jimmy Stewart and Henry Travers portray believable characters, and Donna Reed gives a standout performance at Bailey’s wife. It’s a Wonderful Life is particularly interesting because it uses one man’s life to demonstrate the butterfly effect-- how a small change at one place can result in larger changes later. The film is a timeless classic and excellent family film. It encourages us to believe in ourselves and each other. Chike Classic DVD Price back to $17.